As a reader of this blog, I thought you might have an interest in this article. I’d be interested in hearing your thoughts in response to the article. For the original publication of this article please click here. As a whole, America’s farmers are in the latter group. At the same time steam power was being harnessed to drive the industrial revolution, steam engines were put to work threshing grain across the nation. Soon after the horseless carriage made its appearance on city streets, gasoline engines began replacing steam power and horses and mules on farms. By the 1950s, American farmers were not only feeding the nation, they were using mechanization, improved methods of pest control and a host of other new ideas to feed much of the world. University research and Extension have been responsible for much of the basic and applied science behind agricultural innovations. The nation’s land grant system of colleges and universities was established in 1862 with the specific mission of providing training and research in support of American agriculture and industry. In 1914, the Extension Service was created to provide an efficient, systematic means of getting university-based information to farmers and others in rural areas. Almost immediately, the car, the telephone, publications and newspaper articles were pressed into service by Extension agents to reach rural residents with the latest information about crop production, as well as educational programs to improve health and nutrition in rural areas. By the 1980s, affordable personal computers and mobile phones began revolutionizing communications and business management for all Americans, including those in rural areas. Extension personnel were quick to adopt the new technology for computer-based crop production systems for farm enterprise management. One such program, Fishy software, was developed in 1982 by experiment station and Extension agricultural economists at Mississippi State University for use by catfish producers. The latest version, Fishy 9.0, is used in the management of about 30 percent of the nation’s catfish pond acreage. 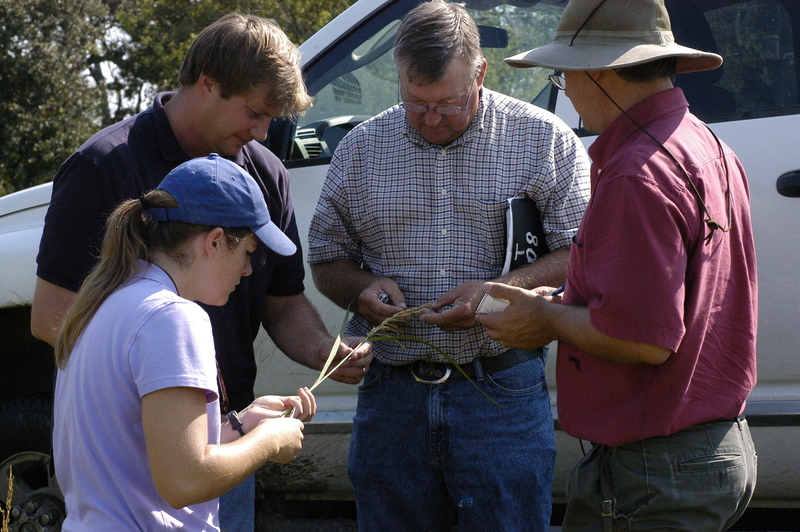 For decades, the way to get help with a question about a crop, animal health, lawn care or almost any other farm or household problem was “call the county Extension office.” While county offices are still an excellent source of information, Extension agents and specialists can be reached almost anywhere via their cell phones or on the Internet. Crop consultant Cecil Parker says he uses his cell phone to receive information from LSU AgCenter Extension specialists and agents as he works in fields in the Louisiana Delta. Blogs, Face Book and other social media are increasingly popular ways for farmers and others to not just access Extension information, but also to interact with Extension personnel, according to Hummel, an LSU AgCenter rice insect specialist. Yalobusha County, Miss., cotton producer Coley Little Bailey also is in touch with Extension whenever and wherever he needs information. Extension’s 4-H youth program also has adapted to meet changing needs. While livestock shows and other rural-based projects remain extremely popular, today’s 4-H’er might be learning to build remote controlled robots or a personal Web site. Young people in 4-H also have the opportunity to participate in the Congressional Awards program, which emphasizes leadership and community service. Extension personnel are also using new communication tools to share knowledge among themselves as well as the public. Launched in 2007, eXtension (http://www.extension.org/) is a Web-based interactive learning environment where Extension professionals and experiment station researchers at 74 land grant universities share information that is then made available to consumers. eXtension enables Extension personnel across the nation to see how their counterparts are responding to client needs. The original mission of the Extension Service was to provide information and educational programs to farmers and others in rural areas, but the organization has changed to meet the nation’s changing needs. Support for the men and women who produce food and fiber is still a core mission of Extension, but training programs for food service workers, local government officials, pesticide applicators and others are now provided by Extension professionals. Also part of today’s Extension Service are distance learning programs on healthy eating, child care, personal finance management and a host of other topics. What began as a program to get unbiased, university-based information into the hands of people hungry for knowledge is still serving that mission — only the tools have changed. Frankie Gould is with LSU AgCenter Communications, fgould@agcenter.lsu.edu. Bob Ratliff is with the Mississippi State University Office of Agricultural Communications, bobr@ext.msstate.edu. Yesterday we planted two demonstration sites. 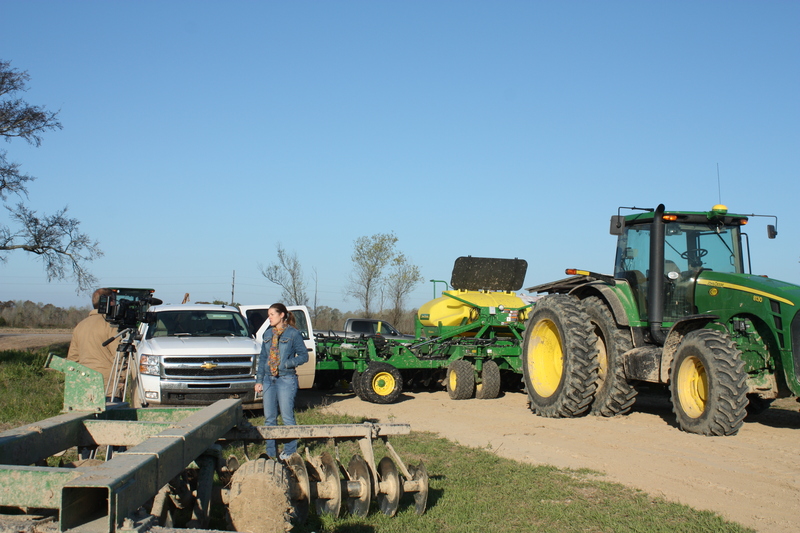 We started bright and early at Charlie Fontenot’s farm in St. Landry Parish. Michael Fruge and Sunny Bottoms (both with Horizon Ag) brought their 20 foot Great Plains drill out to the site. Vince Deshotel met me a the farm office and told me that he had received a call from Kent Guillory telling us that Dave Morein decided to plant his colaspis test site that afternoon. So, it turned out to be a full day of rice planting. The weather could not have been better and the blue skies with white fluffy clouds were breathtaking. Planting started with two passes of CL151 seed that was not treated with an insecticide. This untreated area borders the field road and is next to a marshy area with trees. There is a good chance that if weevils are overwintering, they will be found near this edge of the field. After two passes of untreated seed, we cleaned out the drill, and loaded sacks of Dermacor X-100 treated CL151. 6 passes of Dermacor treated seed was planted at the 65 lb seeding rate. The drill was cleaned out again and loaded up with CL151 treated with CruiserMaxx. At this point, we started planting a seeding rate trial. CL151 was planted at a variety of seeding rates. This will give us a chance to evaluate CL151 at different seeding rates, and also the efficacy of CruiserMaxx at a variety of seeding rates. This site was chosen because Charlie is suspicious that he experienced stand loss from Colaspis larvae damaging seedlings last season. If the colaspis show up this season, we will be able to compare Dermacor X-100 and CruiserMaxx activity against this pest. Also, in the past Charlie has treated with pyrethroids for weevil management. We are curious to see what the rww population is typically like at this site. Of course, this year may not be a typical year. That remains to be seen. I asked Charlie to call me when first emergence of seedlings is observed. We’ll take observations on date of first emergence, and then stand counts and plant height 14 days after emergence. If colaspis are a problem in this field, the damage will be observed in those first few weeks after emergence. We left Charlie’s at about 11 am to head over to Evangeline Parish. On the way Dave called, because there had been a break-down and planting would be delayed until about 2 or 3 pm. No problem, we just took our time heading east. When the time was right, we headed over to meet Dave Morein, Brian (Dave’s son who is now farming with him full-time), and Dennis Fontenot (Consultant). When we pulled up dark clouds were threatening and rain started sprinkling lightly as we were planting the last field. This series of fields is bordered on three sides by Miller Lake and a thick stand of trees. Historically, there are high populations of rice water weevils. Dennis had scouted this field site for us last season to monitor the adult colaspis in a field of beans next to a cut of rice that had substantial stand loss from colaspis damage. In this test we will again compare an untreated check to CruiserMaxx and Dermacor X-100 seed treatment. When we arrived, Dave had some Dermacor X-100 treated seed still loaded in the drill. left-over from planting another field. We vacuumed out the hopper and loaded untreated seed. This series of fields is planted in CLXL729 at a 25 lb seeding rate. In our test, we are comparing an untreated field, and two passes on the south side of a neighboring cut (both are the high points in this area) to Dermacor X-100, and CruiserMaxx treated fields. We will be scouting intensively during the first two weeks after emergence to see if the colaspis larvae overwintered and may cause damage in the rice. Dennis had GPS marked his sampling sites in the untreated rice field and we will mark those with flags and sample the area for larvae. It will be interesting to see if there is a relationship between the adult colaspis population in the soybeans last season, and the population of colapsis larvae in the seedling rice this season. I’m not sure what transpired with the rain that was just starting to come down when we left the field. I’ll be checking in with Kenneth LaHaye this afternoon. 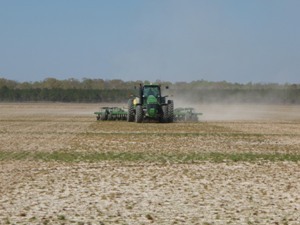 Tentative plans are to plant at the LaHaye farm in Evangeline Parish tomorrow. Of course, it all depends on the weather. 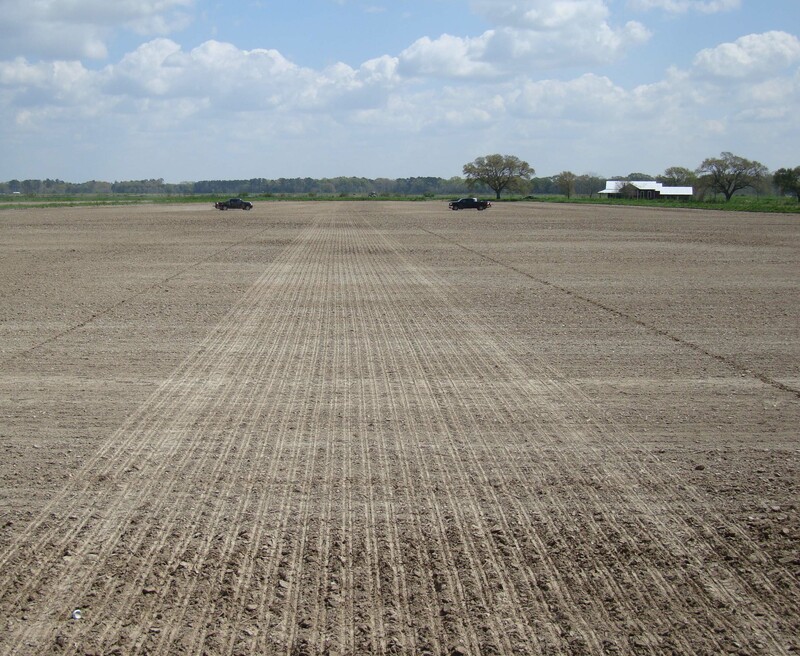 We also may plant in Acadia, Concordia, and Evangeline Parish this week. Sorry I did not include pictures, I need to load my download cable in my camera bag. I’ll try to add pictures in the next few days. 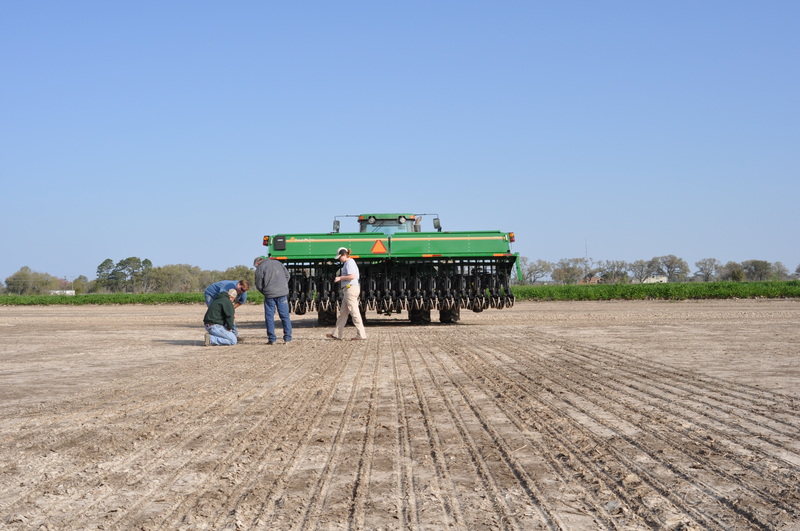 Today we planted a Horizon Ag Strip Trial at the Lawson Farm in Crowley, La. 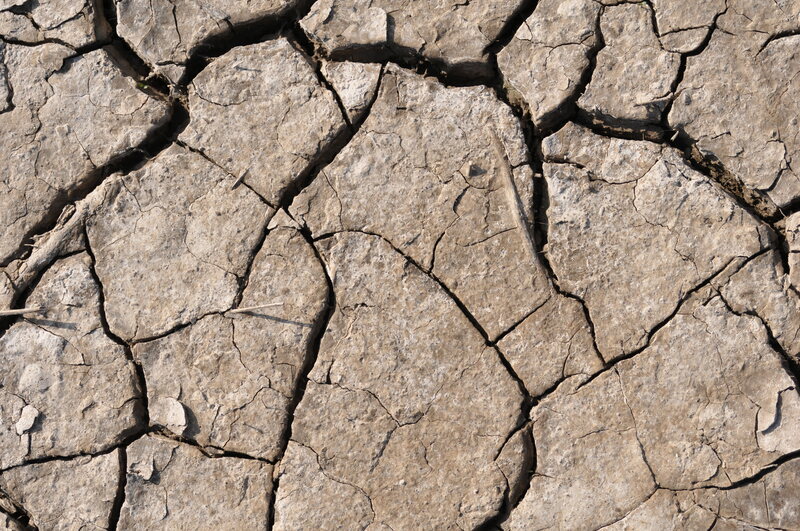 At first, we weren’t sure if the soil was dry enough, and there was also a light crust on the soil. Rain the previous week had left a crust on the soil. The soil did not want to close over the drill passes - went to plan b. We were not happy with this drill row appearance - seed is not adequately covered. After breaking the crust with a harrow, we were able to drill the seed. Lightly and quickly running a harrow before the drill broke up the crust enough to allow closure of the drill rows. This test will compare CruiserMaxx and Dermacor X-100 to an untreated check. 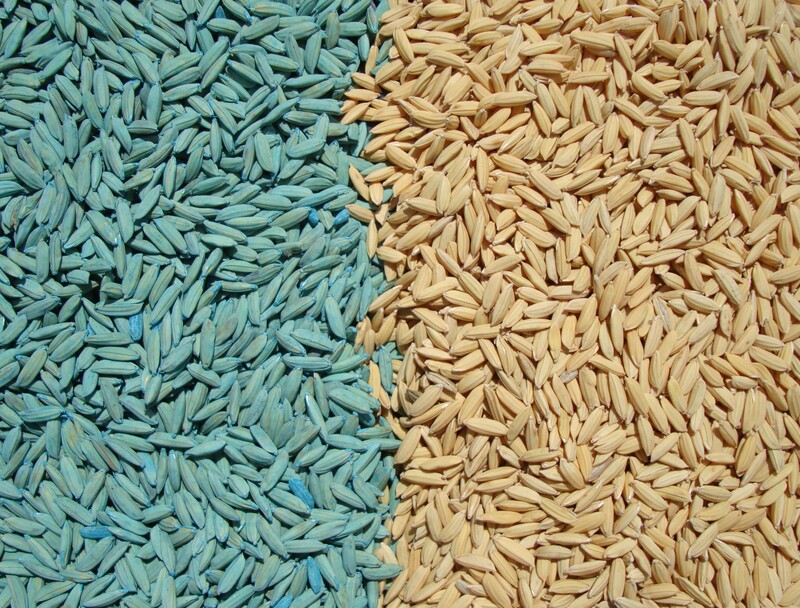 Treated seed receives a dye - on the left is CruiserMaxx treated seed and on the right is untreated seed. We will be looking for colaspis activity in addition to rww efficacy. A number of clearfield varieties were planted. In a nearby field, we will compare a variety of seeding rates with CruiserMaxx treatment. This will help us answer some of the questions about CruiserMaxx activity at lower seeding rates. RWW core samples will be taken 4 weeks after permanent flood to assess insecticide activity. There is nothing like the appearance of straight, newly planted drill rows. I was impressed by the driving – no GPS used here! We will be closely watching these two fields for first emergence of seedlings. 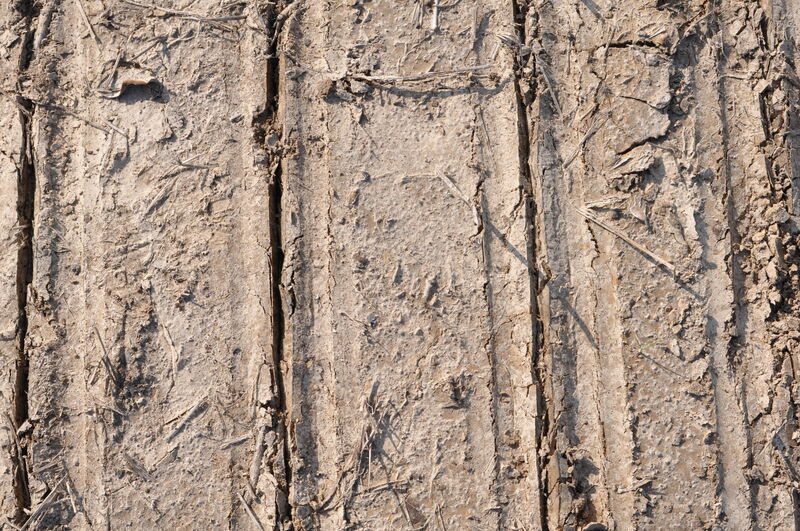 Previous research in Arkansas has found that Cruiser treated seed emerges more quickly than untreated seed. Also, the first two weeks after emergence are a critical time to monitor for damage from colapsis larvae. I anticipate that we will be planting all over the place next week – if it doesn’t rain Saturday. The instructions are to pray for NO RAIN. 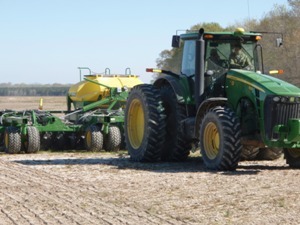 Tomorrow morning we plan to plant in St. Landry Parish. Mark your calendar. The Vermilion Parish Rice Field Day will be held on July 6, 2010. I will post the schedule when it is developed. 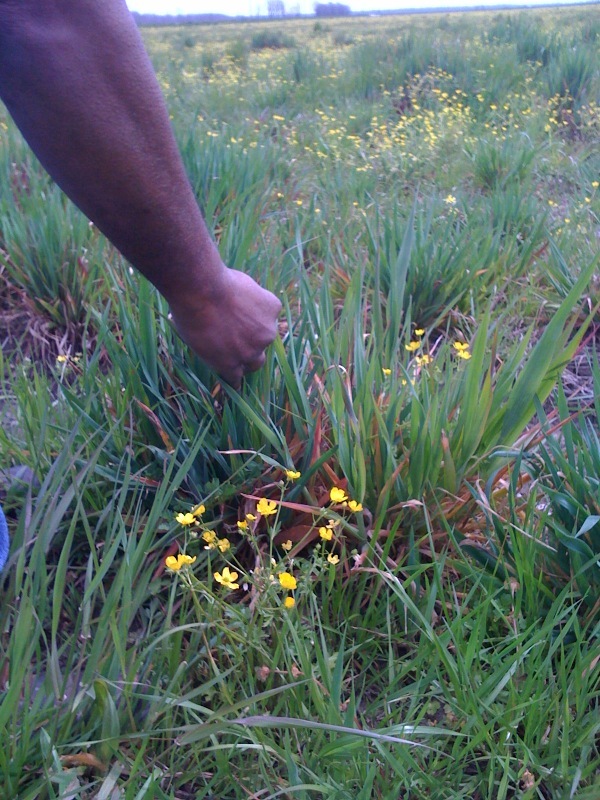 Scouting rice for borers in Vermilion Parish (photo by Jared Normand). This morning I drove up through St. Francisville and Natchez to meet with County Agent Glen Daniels and Rice Manager Dale Denais at Angelina Plantation (Concordia Parish). 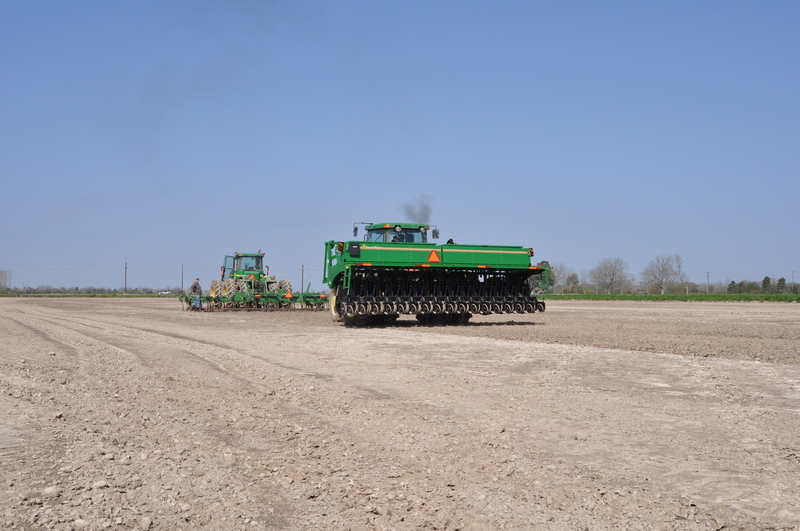 About 4,500 acres of rice will be planted at Angelina this field season. 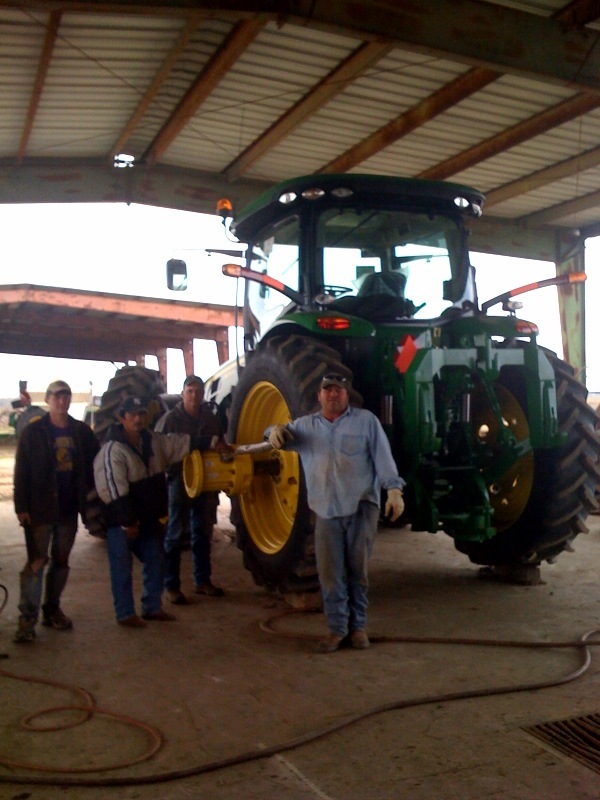 Part of the Angelina crew repairing a tractor in the midst of planting and field preparation. We met Dale at the shop to lay out plans for this year’s rww test. This will be the third year I have worked at Angelina and I am always impressed by the sheer magnitude of their operation. We were greeted by the smell of burning metal from an acetylene torch. Tractors were pulled into the shed for repairs. 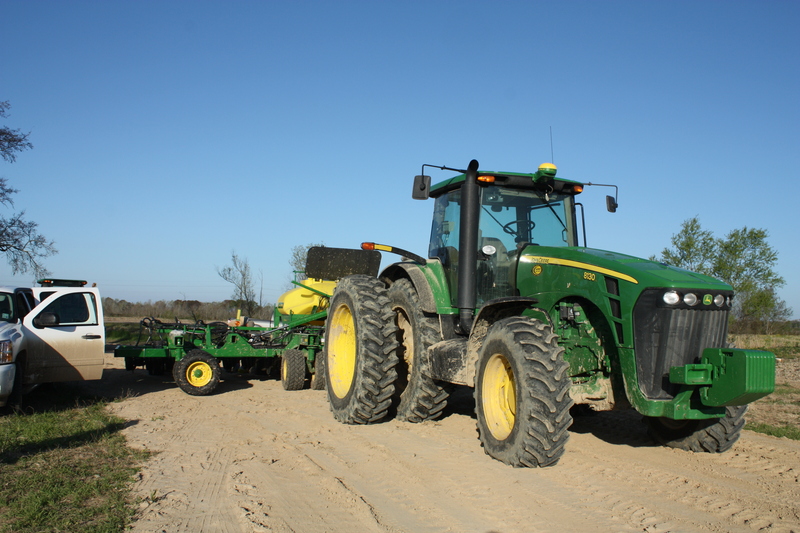 Large equipment is required for managing the large swaths of land that are farmed at Angelina plantation. The plan at Angelina is to compare an untreated check to Dermacor X-100, CruiserMaxx and a pyrethroid treated field. We drove by the fields to look at the arrangement on the ground. The fields will be coming out of cotton and soybean rotations into rice this season. Volunteer oat that is starting to show damage from a burn-down application of round-up. One of the fields had some volunteer oats that was starting to show the symptoms of a burn-down herbicide application. CruiserMaxx treated seed will be drilled in this field in a little over a week. After finalizing plans at Angelina, I headed up the road to Tensas parish to meet with County Agent Dennis Burns and Farmer Rusty Ratcliffe. This year we will have a rww demonstration test at Mound Plantation. We had a test in a neighboring series of fields in the 2008 field season. In 2008, we saw substantial differences in yield between the untreated cuts and those that received a dermacor X-100 seed treatment. This season the rice fields will be planted into newly-plowed ground that was planted in soybeans last season. We will have an untreated cut, bordered by alternating Dermacor X-100 and CruiserMaxx treated sections. A nearby field will receive a pyrethroid treatment. There is a possibility that colaspis larvae may cause damage in this field. The alternating arrangement of Dermacor and Cruiser might allow us to assess the effectiveness of these products against colaspis. 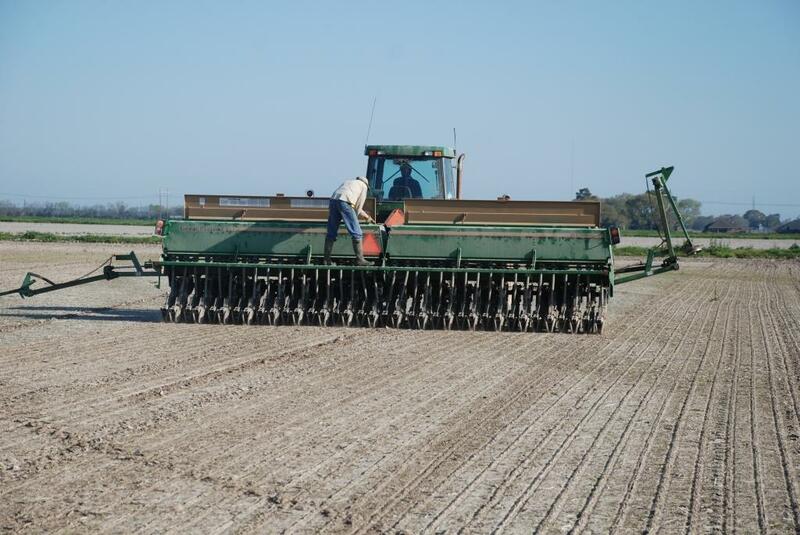 Tomorrow, we hope to plant some rice in Acadia Parish.